These Clamp-On Bucket Forks are built to meet the demands of today's contractor. Mounts to most front loader buckets without the use of tools - easy on/off design. Sturdy all-welded construction provides outstanding performance over years of service. Easy on/off design offers the utmost in convenience when moving palletized materials. Forks extend 14.5 inches under bucket, 8 inches inside bucket. The compact tractor bucket forks have a built-in stake pocket for a 2 x 4 to be installed as an upright backstop (recommended). 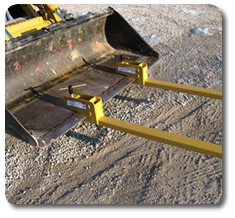 These front loader construction attachments are rated from 1,000 to 4,000 lbs. Lift is limited by fork capacity or loader capacity, whichever is less. View our literature. Bucket-Forks have a useable fork length of 35 to 42 inches. Designed for handling palletized material only. "T" handle design saves time when clamping and unclamping forks. Completely independent - allows fork adjustment to any pallet width.